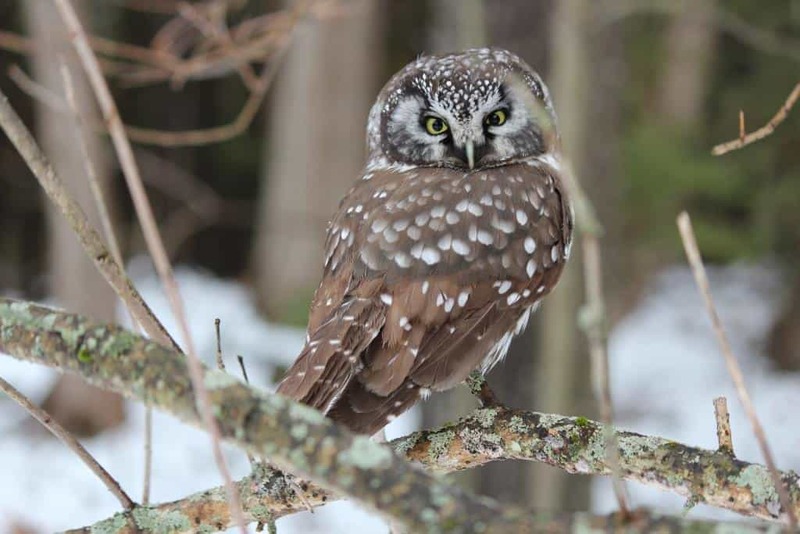 I had a rare Boreal Owl sitting out on a branch in my yard today (Dec. 14) in Warsaw. It was very tame, and I was able to walk right up to it. The owl seemed completely unconcerned by my presence. It was also very nonchalant about the fuss the jays were making over its presence. It was here all day; it just climbed a little higher in the tree when the jays annoyed it too much. The chickadees also kept a wary eye on it. Unfortunately the bird was gone the next day. I was, however, able to get a picture. Note from Tim Dyson: “Looks to be an adult, based on light and dark tones of wing and back feathers. Yet, hard (due to shadows) to see this kind of difference among the large flight feathers of the wing.